practicing languages outside the classroom is more fun! 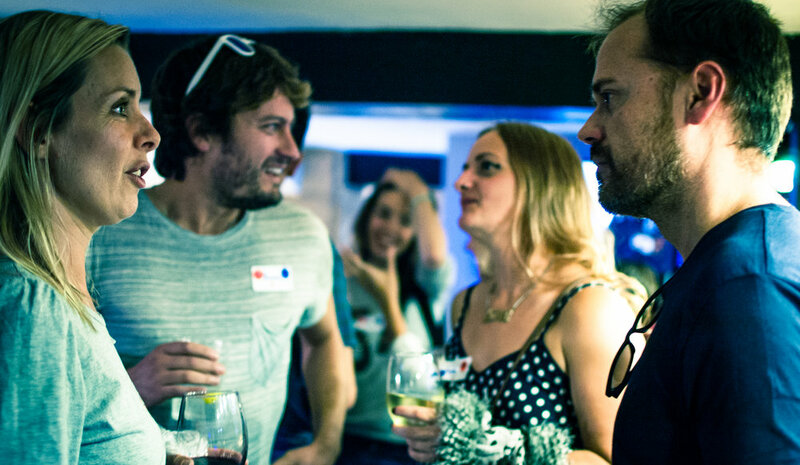 ABLA has been organising language exchange events since 2014 and it has become the must-go destination for all those interesting in practicing languages in Ibiza outside the classroom. We always meet in trendy bars around town because hey! languages are more fun when you´re drinking beer right? We practice mainly English & Spanish, but all languages and levels are welcome to our events. Don´t be afraid to come on your own, specially if you´re new on the island, because the friendly ABLA members will welcome you to the group and will be more than happy to chat with you. Look at our events calendar and look for the next ABLA event in Ibiza. RSVP on Facebook and let us know you´re coming. Write on the Facebook event´s wall the languages you speak and the languages you would like to practice. Arrive on time to the event. Upon arrival, Jimmy the host will give you a sticker with your name/nickname, the languages you speak & the languages you´d like to practice. Also, if you´re single and proud, you´ll also get a red heart on your sticker to let everyone else know. Once you have your sticker, Jimmy will introduce to you to other ABLA members who speak the languages you need to practice to get you talking in no time. Apart from practicing languages & meeting new people, we normally play games and we always tend to have Dj´s, special deals on drinks & food and other surprises.